Dr. Pal Dhall is reportedly a brain surgeon, involved as an adjunct professor in bioethics at the Australian National University, but he has never qualified in any field of education, pedagogy or educational psychology. His motivation to try to become an educator was his blind faith in the claimed all-knowingness and Pure Embodied Divinity of the self-proclaimed Godhead and Creator of the Universe, Sathya Sai Baba, who has through decades constantly exposed himself as an ignoramus regarding modern education, the physical sciences, psychology and pedagogy, history (other than that in the Indian scriptures) and much more besides. Pal Dhall has no original ideas on Education in Human Values because new ideas are not permitted in any Sathya Sai related matters, the guru being regarded as infallible and as having said everything that need be known about true value education and everything else besides. 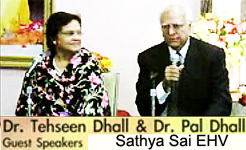 Thus Pal Dhall – and equally so his wife Mrs. Teheseen Dhall – are limited to repeating – in one form or another – only what Sathya Sai Baba has pronounced on education, character, human values and other related matters – all marked by a puritan and obscurantist hodgepodge of religious doctrines that Sai Baba has cooked together to try to gain acceptance as “THE Universal Teacher”…. though it is all mainly based in the teachings and stories of ancient Hindu scripture. In short, not education in any secular or contemporary sense. Of course, in countries where educational standards are controlled and monitored nationally, the Sathya Sai schools and programmes have had to be supplemented by the national curriculum or other standards if they are to gain legality or hope to receive any governmental financial support (excluding India, where the authorities are still often Sai Baba worshippers). Pal Dhall is but one of a considerable number of equally unqualified would-be moralising educators of the young, though among them are a few qualified teachers from various educational systems around the world – all being complete believers in Sathya Sai Baba and his supposed ‘eternal wisdom’. If any of them were to diverge in any notable way from the Sai Baba doctrine, they would find themselves side-lined, and if persisting, consigned to oblivion as far as Sathya Sai institutions are concerned. 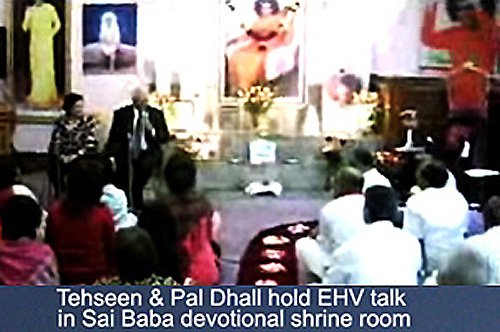 As Director of the Institute of Sathya Sai Education Canberra, Pal Dhall spoke with parents and staff at the Sathya Sai Primary School in Murwillumbah NSW on the 21st September, 2006. Among many simplistic statements he summed up the problem of schooling in Australia with the vague false dichotomy from Sai Baba’s “…the economic agenda has skewed education making ‘what we do’ more important than ‘who we are’.” His view was that it is only through bringing out the inherent spirituality of every child that empowers them through ‘unfolding their divinity’. One informant from Canberra mailed me about Pal Dhall, including the following: “He is the owner of a lucrative Persian rug import company. He is also involved in Real Estate and is a self-made man (filthy rich and prepared to spend, spend, spend for the org.) He is a hindu from India and his wife is a muslim from Pakistan. Pal is a very boooring speaker and if given 20min. for a talk, always goes overtime at least by one hour or more. His knowledge is good though. He fails to practice what he preaches in human values by not considering those who must give talks after him.” See disclaimer. In short, an Indian of the well-known self-important male brand. This is the key of his entire view on child education, as parroted from Sathya Sai Baba’s weird and wonderful world of puritanical ‘Hindu religious spirituality’. Many genuine Hindu scholars have reject ed Sathya Sai Baba’s teaching – and not least many of his actions – as not conforming to the true Hindu code of sanathana dharma (the way of goodness and truth). “There are four phases in the phenomena of spirituality and religion. The first is a local, tribal, limited phase. The next phase is canonical in nature, with scriptures, rigidity, maintenance of guilt and conformance. The next phase is a critical rational phase, which is axial in nature. The final phase is a global phase, where we have many metaphors for the same spiritual reality. We are living, experiencing this reality. It is characterised by an attitude of love and experience of the Divine. This is the accepted ideological fundament of the Sathya Sai Schools, wherever they are, including at the Sathya Sai School, Leicester, which has been demonstrated as not acting upon this moral code of ‘truth and goodness’. This religious basis is pompously promoted in pompous moralising and ‘preaching not teaching’ by Pal Dhall and all those like him in the Sai Baba mini-world of would-be educators of the young. Nowhere in his voluminous verbose output of words will one find Mr. Dhall referring to any genuine professional or scientific authority on religions, education, child development, psychology, pedagogy… nothing. This entry was posted on October 27, 2013 at 11:54 am	and is filed under Sathya Sai Baba. Tagged: Dr. Pal Dhall. You can follow any responses to this entry through the RSS 2.0 feed. You can leave a response, or trackback from your own site.